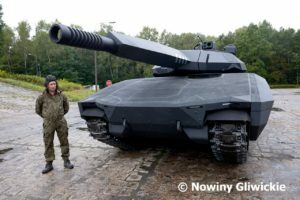 The PL-01 Concept is an advanced Medium Tank developed as a joint project between the Polish Company OBRUM and BAE Systems. 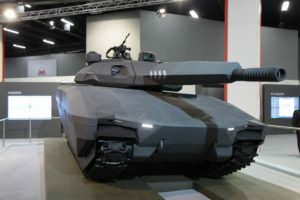 Unveiled in 2013, the vehicle is based on the CV90120-T medium tank by BAE Systems (Sweden) and a planned prototype was due to be built for 2016, ready for trials with the Polish Army. 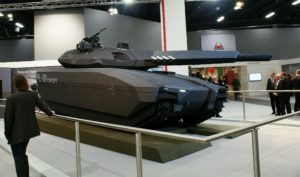 Unlike the CV90120-T, the PL-01 Concept features an unmanned turret with a bustle-fed autoloader for the 120mm main gun. 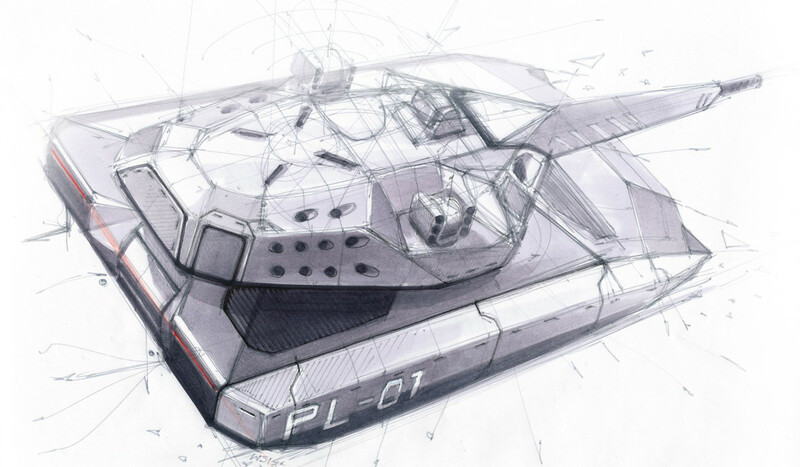 The PL-01 is constructed of steel with modular armor components. These not only mean that when damaged they can be replaced in the field, but can also contain interchangable composite armor, mission dependant, of up to Level 5 (25mm APDS-T rounds). The engine is located in the front of the hull and can act as additional protection. 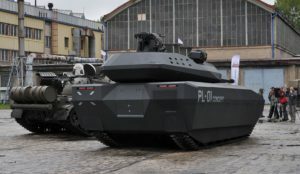 The PL-01 has both “Soft Kill” (laser detection and warning) and “Hard Kill” Active Protection Systems. The Hard Kill system has x2 interceptor launchers, 1 either side of the turret. Each launcher has x4 counter measures which engage incoming threats so as to avoid impact with the tanks armor. The PL-01 shape and surface angles are designed to avoid radar detection. This is further enhanced by the radar absorbing material (used by drones and certain Anti-Tank Missiles) covering the vehicles surface. 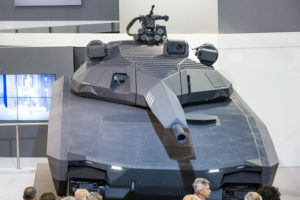 Though not visible on the 2013 demonstrator, OBRUM have stated they wish to improve the design with (or similar) ADAPTIV camouflage system as used on the CV90120 Ghost Medium Tank. 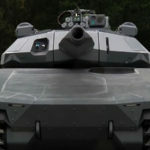 The PL-01 uses the same 120mm Rheinmetall 120 LLR L47 (calibre Length 47) as the CV90120-T Ghost. 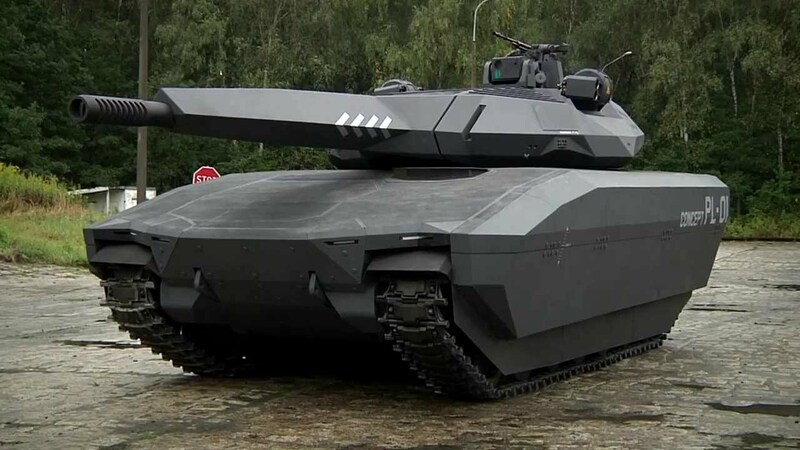 The optimized barrel, use of advanced materials, the recoil buffer system and integrated gun cradle result in reduced weight and lower recoil for use in lighter-weight fighting vehicles. 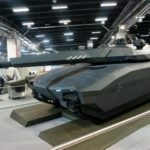 It is capable of firing all Rheinmetalls 120mm ammunition.